Free shipping to United States with $50 purchase from ImagizeYourWorld. See item details below for sale terms. Custom-made-to-order, with the options selected/specified with purchase. * If not specified, length will be 72 inches. * To specify a SHORTER length, please add a note during checkout. * Component styles may vary between colors, sizes and lots. * Lengths of 24 inches or less are listed separately. * For lengths under 10 inches, please request a custom listing. * Terminator Eyelet is approximately 4 mm wide; if you plan to add a pendant (charm, bead, etc.) that may not fit over the eyelet, please add a note during checkout to request that I leave one end not terminated. * To include an Extender Chain, request a custom listing. * To substitute a Magnetic Clasp, request a custom listing. * For a Custom Multi-Strand Cord Necklace, request a custom listing. 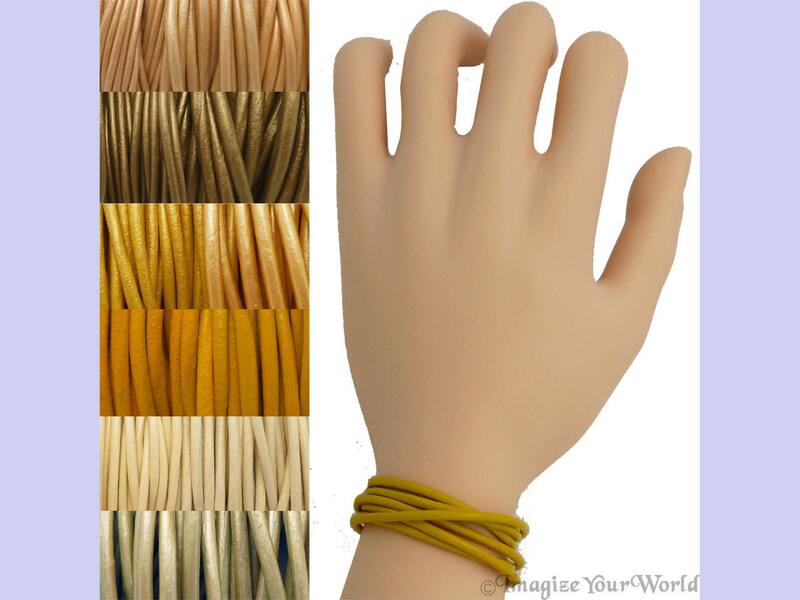 * Cord Colors, Cord Diameters and Hardware Colors are quoted from the original manufacturers. If you have any questions, or need a higher quantity, please contact me. Orders that total $50 or more will receive FREE SHIPPING when selecting USPS First Class Package service to a U.S. address! Quick delivery and lovely packaging. Item was true to color pictured. Have placed another order. A 72-inch leather cord is such a great find. I've not seen one before, and I'll be wearing mine a lot. Leather cords in a dark berry color are hard to find. So I was excited to find the maroon leather cords I ordered and received quickly. Very happy with my purchase. Now I have to decide what color I want to buy next. Custom and Made-to-Order items are not eligible for changes, cancellations, exchanges*, returns or refunds once production has begun. Buyer may choose from USPS First Class Parcel, Priority or Priority Express** during checkout. * Orders that specify First Class Parcel but are too large/heavy to qualify will ship via USPS Priority. * Due to the nature of custom and made-to-order items, selecting a faster transit time does not guarantee a faster handling time. ** If you would like Priority Express, but it is not available as a choice for your item(s), please request a custom listing for your order (include the specific details, such as colors, sizes, etc., and if you have a specific deadline). For gifts being shipped directly to the intended recipient, I can remove the pricing information and/or add a "gift message" to the packing slip, by request (include a note during checkout). * Multiple-item orders and orders placed during peak times may take a little longer. Combined Shipping Discounts will be automatically applied by the system during checkout. Buyer is responsible for providing a complete and accurate shipping address. * Buyer will be required to pay for reshipment of packages returned by the USPS (unless the cause was seller error). Buyer agrees to cooperate fully with any insurance claim procedure, in the event an insured package suffers loss or damage in transit. * If the seller's claim is denied on the basis of the buyer failing to fulfill this obligation, any refund or replacement will be forfeit. Orders are shipped USPS First Class International. Tracking is limited outside the U.S. Thank you for understanding. (1) Customs/importation duties, VAT and/or other fees are the sole responsibility of the Buyer. (2) The item value will be accurately displayed on the Customs Form and Packing Slip. (4) If you would like your phone number included on the shipping label/customs form, please include it in a note during checkout. The above "main menu" page links to various "information only" pages that I have created to provide my customers with additional details and sample photos of the items I make and components I use. These pages are provided to make it easier to view a large amount of information and sample photos in one location. Please NOTE: These "information only" pages do NOT provide pricing, methods of purchase, nor links to any online venues/sites (including Etsy, so please open the provided URL in a new Window or Tab for easy access back to my Etsy Shop). If the item you would like to purchase is not currently listed in my Etsy Shop, please contact me to request that it be added. Due to the nature of Custom and Made-to-Order items, more Communication may be necessary than for “off the shelf” purchases. Please check your messages regularly, and respond when necessary. (If you are submitting a picture/design for a custom-printed item, please remember that you will need to approve a “proof” (mock-up) before production can begin.